All content on this site Copyright ©2002-2006 Dave Pinx. All rights reserved. Williams Defender CPU boards can get corrosion problems from the 3 x AA stick batteries that are used to hold the games memory settings and when the corrosion sets in it can cause a multitude of problems. So a wise idea is to fit a Lithium battery conversion. This does away with the corrosion problem and as its a single button type cell replacement, it lasts alot longer than the 3 x AA's would. Pic on right shows origional type holder with green corrosion on the contacts, this will spread along the tracks to other components, if not dealt with. 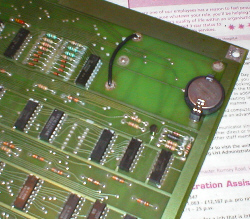 I started by turning over the pcb and with a soldering iron and solder sucker, removed as much of the solder as i could from the 6 pins on the back of the holder. Once i had done this i then used solder braid to remove the last traces of solder still left in the holes. 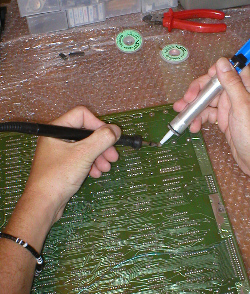 It was then a case of resting the pcb on its edge and gently pulling on the battery holder with one hand, whilst heating the pins with the soldering iron from the other side of the pcb. Then slowly it came free from the pcb. 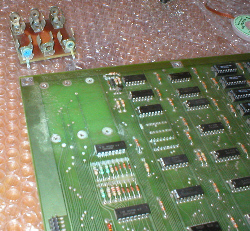 Once i had the old holder removed from the pcb it was time to clean up the solder pads which the holder was solder'd to and clean any tracks and replace any components near to the holder that showed signs of corrosion. I started cleaning this area of the pcb with flux / pcb cleaner which is in aeorsol form and used an old toothbrush to rub it in. Once this had evapourated i used isopropanol alcohol and again gave it a good rubbing in with a toothbrush. I then gently rubbed all the effected areas with a piece of 3M Scotchbrite. 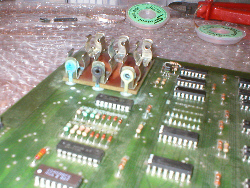 I then gave one last wash with the alcohol and left it to dry in a warm place (i use the airing cupboard) Once this was dry i reflowed new solder into all six pads and replaced 3 of the 9316 IC's that had shown corrosion on their legs, i could'nt get any 9316 chips so i used 74161 IC's instead, which are a direct replacement. Fitting the Lithium Battery kit. With the clean up done, it was now time for me to install the Lithium battery kit, these are available from Dave 2084 in the U.K. or Bob Roberts in the U.S.A.